If my back wasn't bothering me today, I would be at the Dr. Sun Yat Sen Gardens on Friday night, as my friends Qiu Xia and Andre Thibault put on a very special music concert with their erhu playing friend Ji-Rong Huang. Andre and Qiu Xia have a very special place in the world of Gung Haggis Fat Choy. Silk Road Music Ensemble performed in the CBC Vancouver television performance special, and Silk Road Music Duo have performed at Gung Haggis Fat Choy Robbie Burns Chinese New Year dinners over the years. This entry was posted in Main Page on August 31, 2007 by Todd. for 30 years. Todd couldn't be that old! Public Library staff when I was 15 years old, back in 1975. Greenwood, and city librarian Paul Whitney remain on friendly terms. access to ESL programs in many of the branches. that he can't understand why the City won't agree to mediation. Group to handle communications during the strike. as far as math goes,” she added. dental fillings because of problems associated with mercury fillings. for work of equal value. comply with giving…internal equity,” she said. This entry was posted in Library Strike, Main Page on August 31, 2007 by Todd. It was a busy day at City Hall on Wednesday, Aug 29, as three civic unions marched from Science World to City Hall for a rally. 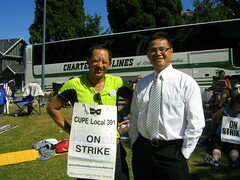 After the speeches were made, City Councillor Raymond Louie was seen talking to some of the city workers. One of my library co-workers suggested giving Councillor Louie one of our “My Civil City has Pay Equity” buttons. I walked over to Raymond, gave him a button, and offered to introduce him to CUPE 391 Vancouver Library workers, as I don't think he knew any of our library workers, nor was aware of the Vision-CUPE conspiracy that was earlier reported in the Georgia Straight: Vision using strike for political gain. Raymond was pleased to be introduced, and shared that he was a union member with CEPUC, the Communications, Energy and Paperworkers Union of Canada, as he had worked for the Pacific Press Group for many years, and also endured many strikes. – but the City had still not responded days after the call, while the unions have said they would welcome a mediator. Louie also said that Mayor Sam Sullivan and the NPA caucus have been very locked into their thinking and difficult to budge. “Our former Human Resources Director left for the business sector, and one of the HR assistants went with her!” I explained as I pointed out that the corporate sector pays more for similar positions. Salaries for Vancouver Public Library employees have fallen behind for 30 years. Our union would accept the Burnaby contract, because it has pay equity. Can we please have the same contract as Burnaby? This entry was posted in Library Strike, Main Page on August 30, 2007 by Todd. It was a busy day as CUPE 391 Vancouver library workers joined the civic strike march from Science World to City Hall. Fiona Tinwei Lam was a finalist for the Vancouver Book Prize in 2003 for her poetry collection “Intimate Distances. Over the years we have become friends, and have shared our joy of Robbie Burns poetry, things Scottish, and discovered we were related through shared cousins. Fiona was born in Scotland, moved to Canada as a young child, and has been a guest for both Gung Haggis Fat Choy: Toddish McWong's Robbie Burns Chinese New Year Dinner and also the Gung Haggis Fat Choy World Poetry readings. She has a younger sister who is a librarian, and whom once paddled on the Gung Haggis Fat Choy dragon boat team. I heard about when Fiona's mother was moved to a care home, as her sister Shona gave me some of their mother's old accordion music. I regret that I was never able to play my accordion for their mother, as she used to play accordion in addition to piano. The following is a very touching story that Fiona has written for the Globe & Mail. I used to wake up some mornings as a teenager to the sounds of my mother playing the piano. But it was never Rustle of Spring or a gentle Minuet in G. Rather, it was the thunderous chords of Chopin's Funeral March. Either it was time to get up, or someone – probably me – was in deep trouble. opening bars of the Funeral March spelled doom and had me racing for cover. decided I'd had enough of the piano. noticed this, as she had committed so many pieces to memory. you could say Battle Hymn of the Republic, and launched into a medley of pub tunes intermingled with hymns, ending with a rousing rendition of Ten Little Indians. “No one minds! It's wonderful that your mother still plays!” She went over to lavish her with praise. teacher, I tried to avoid playing a single note. of the mother I had known growing up. Later, I started playing the piano on my mother's secure floor at her care facility, sight-reading and stumbling my way through Red River Valley and Tea for Two. the end of a song to applaud. rhythm, tempo and volume that would deeply satisfy and calm her. down to play Chopin's Funeral March. The major piano stores must know me as the Morbid One. classical repertoire, I'm going to make the effort, piece by piece. Fiona Tinwei Lam lives in Vancouver. This entry was posted in Commentaries, Literary Events, Main Page on August 29, 2007 by Todd. Daniel Gawthrop then told the assembled library workers that he had brought a number of short articles to read from and offered them a choice: a story about The Curse of Leni Riefenstahl, the killing of Theo Van Gogh, an article about post 9-11, an article about 9-11 in Thailand… but the winning vote was for an debut reading for a soon-to-be-published story titled “Marriage: Why I took the plunge.” It was an entertaining and enlightening story about gay marriage, and the social impact of it both personally and culturally to somebody who had said that he would never get married. Paul Whitney, city librarian stopped briefly by the picket line to say hello. Okay, Paul is management and the union doesn't like some of the things he has said to the media. I have known Paul for over 20 years, mostly by association, but he's always been a nice guy and supportive of some of the events I have organized. He's probably caught between a rock and a hard place as the City negotiates with our Union… so in his own way, he's walking the line. Tom Hansen, retired library worker, former union organizer and former VPL board member comes to give support. This entry was posted in Library Strike, Literary Events, Main Page on August 28, 2007 by Todd. Stan Persky, spoke to Vancouver city library workers on Friday August 24th. He told his audience of picketers, lunch time loungers, and visitors to Vancouver that he came to speak at the library because his “books are locked up.” Stan read from his latest book Autobiography of a Tatoo. collective. He has written many books such as Then We Take Berlin, Son of Socred, Bennet II, and Buddy's. CUPE 391 president Alex Youngberg is surrounded by media as she speaks to Vancouver library workers. Alex told us that with recent positive and understanding articles and columns about library worker issues, she feels that the tide is turning. She cited the recent Globe & Mail article “library workers picket with pizzazz” and Don Cayo's column in the Vancouver Sun. Daniel Gowthrop will speaks today on Monday, August 27th. Boreal Forest . Daniel also works in the CUPE national office. Hmmm… what a coincidence. This entry was posted in Library Strike, Main Page on August 27, 2007 by Todd.